In the 2018 financial year, the Supervisory Board dutifully fulfilled the responsibilities entrusted to it by law, the company’s articles of association and rules of procedure, and the German Corporate Governance Code. We continuously monitored the Executive Board’s management of business, provided advice on the company’s further strategic development as well as on important individual measures, and concluded that the management of the company is lawful, proper and appropriate. We also constantly monitored the organisation of the company and the Group, the risk management system and the economic viability of management activities, and satisfied ourselves that all of them were fit for purpose. The Supervisory Board was involved in all decisions of major significance for HHLA and the Group. The Executive Board provided us with regular, prompt and comprehensive information on all major developments, especially the situation of HHLA and the Group, corporate planning, fundamental issues of company policy and strategy, investment plans and personnel. All measures for which the approval of the Supervisory Board or one of its committees was required by law, the articles of association or the Executive Board’s rules of procedure were submitted on time. After conducting their own examination and in-depth discussions with the Executive Board, the Supervisory Board or Supervisory Board committees approved all such measures. As Chairman of the Supervisory Board, I was also regularly in touch with the CEO and the Executive Board members between meetings and was informed about planning and strategy, the current business situation, significant transactions, the risk position, risk management and compliance. The Supervisory Board held four routine meetings and four special meetings in the 2018 financial year. The financial statements meeting held on 23 March 2018 focused as scheduled on the auditing and approval of HHLA’s annual financial statements, including the individual divisional financial statements for the A and S divisions, the consolidated financial statements including the subgroup financial statements, the combined management report of HHLA and the Group, the Supervisory Board report, the reports on transactions with related parties and on the relationship between the A and S divisions and the separate non-financial report, each for the 2017 financial year, as well as the agenda for the 2018 Annual General Meeting, including the Executive Board’s proposal on the appropriation of profit and the candidates proposed for the election of the auditor for the 2018 financial year. Representatives of the auditor were present at the meeting. They reported on the main results of their audit and were available to answer questions. In this meeting, the Supervisory Board also approved the acquisition of the Estonian terminal operator Transiidikeskuse AS and the rest of the shares in Metrans a.s., as well as authorising borrowing for the long-term structuring of the purchase prices for both of these acquisitions. As a follow-up to this meeting, the Supervisory Board then finally agreed on the proposed candidates for the election of new shareholder representatives at the Annual General Meeting on 12 June 2018 by way of a written circular. In our second regular meeting on 1 June 2018, we discussed an investment project, the granting of powers of procuration, preparations for the Annual General Meeting and preparations for auditing the efficiency of the work carried out by the Supervisory Board. The first special meeting following the Annual General Meeting on 12 June 2018 served to make the committee appointments required due to staff changes on the Supervisory Board. The main focus of the ordinary meeting held on 7 September 2018 was on presenting and discussing the results of the efficiency audit, which was carried out with the help of an independent advisor. Overall, cooperation was rated very good and efficient. In this meeting, we also discussed a smaller investment project and the granting of additional powers of procuration. As part of a special strategy meeting in October 2018, we carried out an in-depth analysis of HHLA’s strategic framework and strategy in individual areas of business in the presence of expert guests. In a further special meeting in October 2018, we also discussed two investment or rather equity investment projects. In our final regular meeting on 7 December 2018, we routinely dealt with the budget for 2019, the medium-term planning for 2020 to 2023 for the Group and for the two subgroups, the findings of the risk and opportunity inventory and the declaration of compliance with the German Corporate Governance Code. We also once again discussed an investment project and matters concerning the Executive Board. In our special meeting on 21 December 2018, we finally extended Ms. Titzrath’s term of office by five years – following extensive preparations by the Personnel Committee – and appointed Mr. Torben Seebold to the Executive Board as of 1 April 2019 as successor to the departing Labour Director Mr. Brandt. As a general rule, Supervisory Board meetings are attended by all of its members and – provided Executive Board matters or internal Supervisory Board topics are not discussed – the members of the Executive Board as well. The average attendance at the meetings of the Supervisory Board and its committees in the reporting period was approximately 88 %. With the exception of Dr. Bösinger, who left the Supervisory Board in April 2018 and could not take part in the Supervisory Board’s financial statements meeting due to his schedule, no member of the Supervisory Board attended half or fewer of the meetings of the Supervisory Board and the committees to which they belong. No conflicts of interest regarding members of the Executive Board or the Supervisory Board arose in the reporting period. The Supervisory Board does not include any former members of the company’s Executive Board. The Finance Committee and Audit Committee each met once per quarter in the 2018 financial year, i.e. each committee met four times. At its meetings, the Finance Committee regularly looks at the Group’s financial results as well as its general financial and earnings position. The Finance Committee also addressed various equity investment projects and investments during the reporting period, specifically the acquisition of the Estonian terminal operator Transiidikeskuse AS and the remaining shares in Metrans a.s., as well as authorising borrowing for the long-term structuring of the purchase prices in this context. Finally, other points discussed in the December meeting were the detailed preliminary review of the budget for 2019 and the medium-term planning for 2020 to 2023. The Audit Committee’s work regularly focuses on overseeing accounting, the accounting process and the audit. This includes monitoring the effectiveness of the audit, the internal control system, the risk management system, the internal audit system and compliance, along with the compliance management system. It also involves overseeing the selection of the auditor and the auditor’s qualifications, efficiency and independent status, and the admissibility of any additional services provided by the auditor (known as non-audit services). To do this, the Audit Committee has adopted a catalogue of basic approved non-audit services by type and scope. Other key issues at the various meetings held during the reporting period included a detailed discussion and examination of HHLA’s annual financial statements, the consolidated financial statements and the combined management report for the 2017 financial year (March meeting). This was followed by an in-depth consideration of the six-monthly financial report for 2018 and its review (August meeting). At both meetings, representatives of the auditor reported on the results of the audit or review and were available to answer questions. Other areas of focus were the interim reports for the first and third quarters, the organisation and audit remit of Internal Audit, the determination of key issues for the audit of the Annual Report and consolidated financial statements for the 2018 financial year, the findings of the 2018 risk and opportunity inventory, the plans for the 2019 audit and the preparation of the declaration of compliance with the German Corporate Governance Code. In addition to the committee members and representatives of the Executive Board, HHLA’s Compliance Officer also regularly attends the meetings of the Audit Committee, where he speaks about his role, keeps the committee abreast of current developments, and is available to answer questions. Other participants, such as representatives of the auditor or Internal Audit, attend meetings as necessary. The Chairman of the Audit Committee is also regularly in touch with the auditor and the Chief Financial Officer between meetings. The Real Estate Committee held two meetings in the reporting period. It focused on the general development of business and the discussion and audit of HHLA’s annual financial statements – including the separate financial statements of the S division – as well as the consolidated financial statements, the combined management report and the separate financial statements of the real estate companies for the 2017 financial year (March meeting). The committee also dealt with the budget for the 2019 financial year and the medium-term planning for 2020 to 2023 (December meeting). In each case, its deliberations related to the Real Estate subgroup (S division). The members of the Nomination Committee convened once in the 2018 financial year in order to prepare for the necessary election of new shareholder representatives at the Annual General Meeting on 12 June 2018. The candidates put forward by the Supervisory Board took into account not only the requirements of the German Stock Corporation Act, German Corporate Governance Code and the Supervisory Board’s rules of procedure but also the specifications of the profile of requirements issued by the Supervisory Board. The Personnel Committee met six times during the reporting period in order to prepare for the staffing decisions made by the Supervisory Board – specifically, the extension of Ms. Titzrath’s term of office and the selection of a successor to Mr. Brandt, who will be leaving the Executive Board on 31 March 2019. There was no reason for the Arbitration Committee to convene during the 2018 financial year. In line with the Audit Committee’s recommendation and the Supervisory Board’s nomination, the Annual General Meeting on 12 June 2018 elected PricewaterhouseCoopers GmbH Wirtschaftsprüfungsgesellschaft, Hamburg (PwC), to conduct the audit of the Annual and consolidated financial statements for the 2018 financial year and to conduct the review of the Condensed Financial Statements and the interim management report of the Group for the first half of the 2018 financial year. In line with the legal requirements and the recommendations of the German Corporate Governance Code – especially those relating to the auditor’s independence – the Audit Committee then negotiated the audit assignment, defined the focus areas of the audit and awarded the contract. The auditor carried out an audit of HHLA’s annual financial statements for the 2018 financial year as provided by the Executive Board, including the divisional financial statements for the A division (Port Logistics subgroup) and the S division (Real Estate subgroup) presented as part of the notes, in line with the provisions of the German Commercial Code (HGB), the consolidated financial statements for the 2018 financial year including the subgroup financial statements for the A and S divisions in accordance with the International Financial Reporting Standards (IFRS) that apply in the European Union and the additional requirements of German commercial law pursuant to Section 315e HGB, and the combined management report for HHLA and the Group for the 2018 financial year. The auditor issued an unqualified opinion with respect to each of the foregoing. Finally, the auditor reviewed the combined separate non-financial report in line with Section 289b et seqq. and Section 315b et seq. HGB to achieve a limited degree of certainty, reported the review findings and issued an unqualified opinion. Each of the above-mentioned financial statements and reports along with the corresponding audit reports was distributed to all members of the Supervisory Board as soon as it had been produced and checked. The documents were subsequently explained by the Executive Board at the relevant meetings of the Audit and Real Estate Committees on 18 March 2019 and at the Supervisory Board’s financial statements meeting held on 22 March 2019 before being discussed in detail by the committees and the Supervisory Board as a whole. Representatives of the auditor were present at the meetings, where they reported on the scope, focal points and key findings of the audit and were available to answer questions. They paid particular attention to the key audit matters described in the certificate along with the audit procedures used and the conclusions regarding the accounting-related internal control and risk management system. Finally, they also reported on the nature and extent of the other services provided by the auditor. As part of the preliminary review, the Audit and Real Estate Committees closely examined the course of the audit, the auditor’s reports, the findings and – in particular – the key audit matters described in the certificate. Once they had completed their examination, they recommended that the Supervisory Board as a whole approve the financial statements and reports. Following a detailed plenary examination of the auditor’s reports and findings and the findings of the committees’ preliminary review, and based on our own review, we approved the findings of the audit. Following our review, we had no objections to make to the annual financial statements including the divisional financial statements, the consolidated financial statements including the subgroup financial statements, and the combined management report for the 2018 financial year. Accordingly, we approved the annual financial statements, the consolidated financial statements and the combined management report at our meeting on 22 March 2019. HHLA’s annual financial statements for the 2018 financial year have therefore been adopted. Following our review, we also had no objections to make to the Executive Board’s statements on related parties and on the relationship between the A and S divisions. Finally, following our review, we had no objections to make to the combined separate non-financial report for the 2018 financial year. The Executive Board’s proposal for appropriation of the distributable profit was analysed in detail and discussed with the Executive Board at the meetings of the Audit Committee – for the A division – and the Real Estate Committee – for the S division – on 18 March 2019 and at the Supervisory Board’s meeting on 22 March 2019. Following our own review, which paid particularly close attention to earning trends, financial planning and shareholders’ interests, we endorsed the Executive Board’s proposal for appropriation of the distributable profit. Together with the Executive Board, we will propose to the Annual General Meeting that a dividend of € 0.80 per dividend-entitled class A share and € 2.10 per dividend-entitled class S share be distributed from distributable profit for the 2018 financial year. Within the Executive Board, we extended Ms. Titzrath’s term of office by five years. 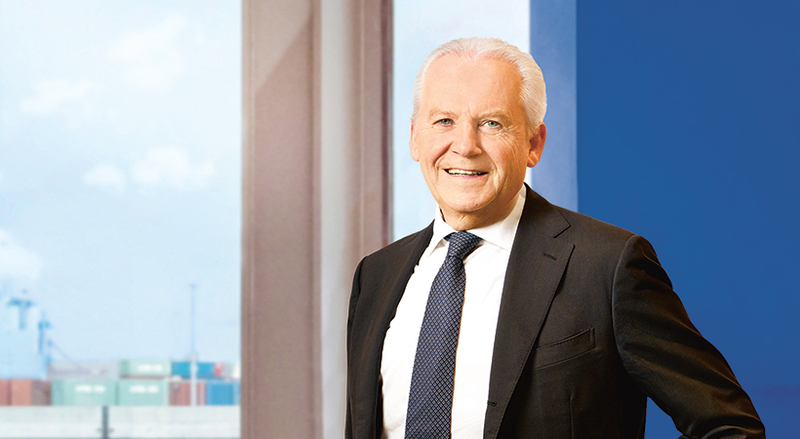 After Mr. Brandt informed us in September 2018 that he would be leaving the Executive Board as of 31 March 2019, the Supervisory Board initiated the necessary steps to find a successor and in its meeting on 21 December 2018 – upon completion of preparations by the Personnel Committee – appointed Mr. Torben Seebold to the Executive Board as of 1 April 2019 as Labour Director for an initial period of three years. The Supervisory Board would like to take this opportunity to thank Mr. Brandt for his many years of successful work on behalf of HHLA. Mr. Westhagemann also resigned his seat on the Supervisory Board as a result of his appointment to the Senate of the Free and Hanseatic City of Hamburg, effective as of 6 February 2019. Once the Nomination Committee has completed its preparations, the Supervisory Board will submit a recommendation for his successor to the Annual General Meeting on 18 June 2019. In doing so, the Supervisory Board and its Nomination Committee will take into account not only the requirements of the German Stock Corporation Act, German Corporate Governance Code and the Supervisory Board’s rules of procedure but also the specifications of the profile of requirements issued by the Supervisory Board. The Supervisory Board would like to thank all departing members for their reliable good work and dedication to the Supervisory Board. Finally, on behalf of the Supervisory Board, I would like to thank the members of the Executive Board and all Group employees for their hard work in the 2018 financial year, and our shareholders and business partners for the trust they have placed in us.